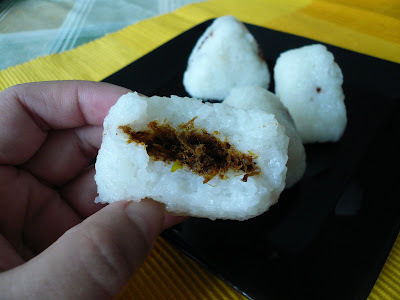 I made some lemang for Hari Raya the other day and I had some leftover glutinous rice. So I made some pulut panggang and as for the filling I just used beef serunding. 200 grm of glutinous rice - soak for at least 3 hours. 1) Mix glutinous rice with coconut milk, salt and steam until cooked. 2) Spread some glutinous rice on banana leaf and add in some filling. 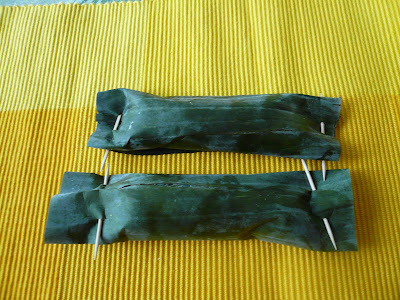 3) Roll up the banana leaf and secure both ends with toothpick. 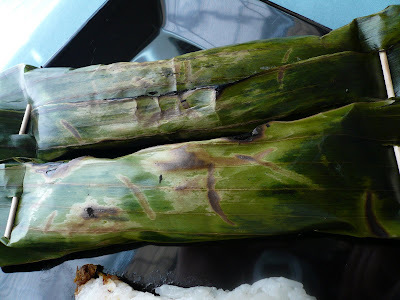 4) Set the oven to broil and grill the rice for a few second or until the banana leaves is slightly charred. Note : For the filling you can make some dried shrimps with coconut. oh lovely, I saw this in Kuala Terengganu..... but I think yours is much more lovely. wow lovely long time ago have eat this now don't even remeber wat it test like anymore by the way how u can get those leaf in usa ? Your pulut panggang looks delicious. Pulut panggang always brought back my memory to Malaysia where I can always buy this at the stall. Thanks for your recipe. I will have to find time to make this. u know what, daun pisang tu pon nampak cantik aje color dia..
Yum yum.delicious!I hope I could make this. Nice looking Pulut Panggang... Did Carlos eat some? Nonya, yeap just like rempah udang. Pearly, the banana leaves here comes frozen. Jun, my lemang simple saja. Just steam the rice, roll it up in banana leaves and then grill. Can't find bamboo here :) You can buy so easily in M'sia buat apa nak buat :) :) Yeah, this daun pisang memang very fresh and it actually came frozen. Sweetiepie, can you find banana leaves there? i so crave for this last bulan puasa but didnt know (and lazy) to make them. the filling must be good in order for it to be good! 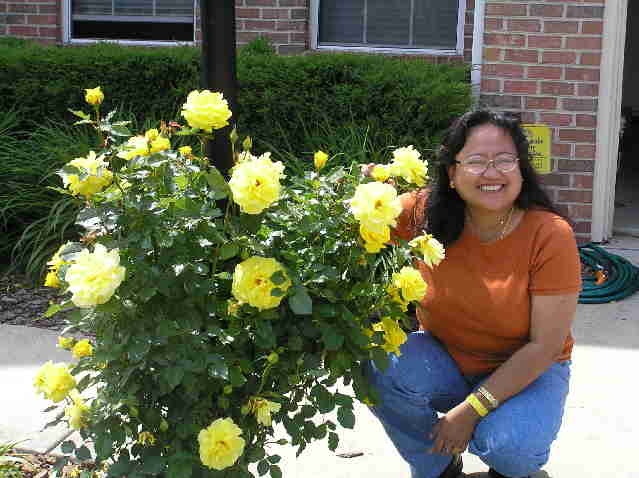 i wish you're my neighbour gert! Ur pulut panggang almost similar like lemper for us. Sometimes, I use abon (dried beef)for filling or spicy shredded chicken. Looks delish with serundeng...yummy! Zaza, I too wish all of you can be my neighbour :) Then all of us can share our food. Beachlover, I think the one sold at the Asian supermarket is for the vietnamese.